They really seemed to enjoy it and were sooooo good. In fact, the staff person in each room took a moment to comment how good they were at standing and listening quietly while they told us about the room and what we were looking at. I guess they are at just the right age for all this! (My budding history buffs!) 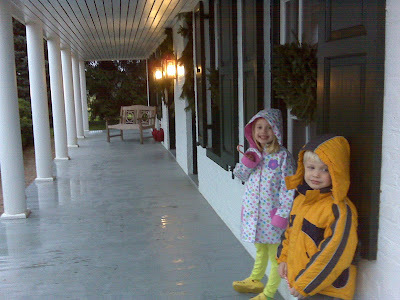 Their favorite room, of course, was the separated kitchen where they got to sample some cookies and cider by the fire. I only wish it hadn't been raining so I could have gotten a better photo out in front of the house that was decorated with wreaths, greens and ribbons. After their interest and patience, I think a trip to Mt. Vernon is definitely in order when the weather gets nicer. Oh and their stellar behavior out of the house meant a good old fight when we got home, so I guess they were just saving it up. Typical kids, but at least I know I can take them out of the house and be proud, right? I've never heard of this. I'll have to google it and look into it (maybe for next year) Thanks!